Carbon monoxide (CO) is known as the silent killer because it is an invisible, tasteless and odourless gas that can be deadly. CO is produced when fuels such as propane, gasoline, natural gas, heating oil or wood do not burn completely in fuel-burning appliances and devices such as furnaces, fireplaces, hot water heaters, stoves, barbeques, portable heaters and generators or vehicles. Over 80% of CO-related injuries and deaths in Ontario occur in the home (source: TSSA). 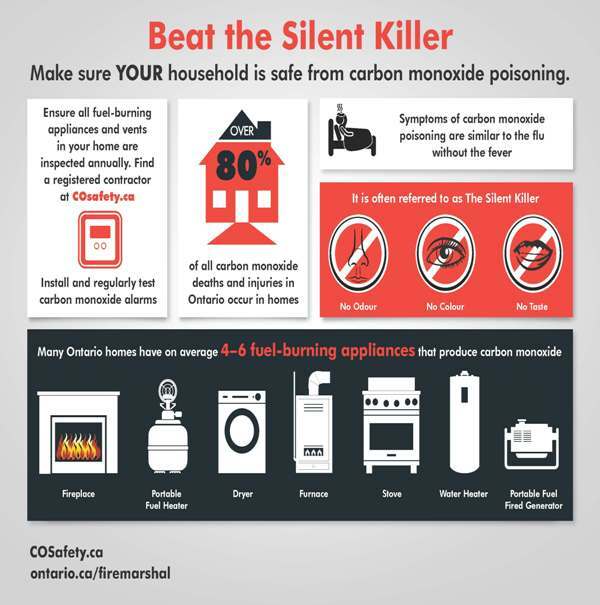 Carbon Monoxide (CO) is known as the “Silent Killer” because you can’t see it, taste it or smell it. 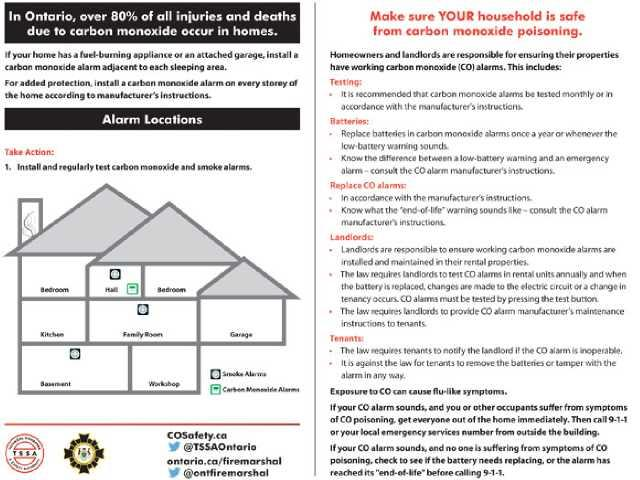 The only way to detect the presence of deadly CO in your home is with a CSA-approved CO alarm. When it comes to carbon monoxide safety, we all have a role to play. Find out what you need to do to help keep you and your family safe and visit the Office of the Fire Marshall for more information. All Fire Services, Emergency Management Information including the Emergency Plan, will be provided in an accessible format upon request. If you require information provided in an alternate format please contact the Clerk.